Distance from the Liberty Stadium: 295 miles ~ 5 hour 15 minutes. Up to 2,500 away fans are in the south stand, on the side of the pitch. The views are good and the back of the stand gives views across the city, including Norwich Cathedral. The club no longer make their own pies but sausage rolls, pies and hot dogs are sold along with Carling, Stowford Press, Worthingtons, and wine. Norwich is a bit on its own geographically, it’s an old city and has heritage landmarks spanning 1,000 years. It is at the centre of a region well known for its Viking heritage. The city is compact enough to get around easily, but also large enough to have many activities and places of interest. Norwich has a huge choice of places to eat and drink in the evenings, many are independent businesses. You can enjoy local produce menus, wholesome and home-made with fine wines and beers. It’s said that there used to be a pub in Norwich for every day of the year but sadly this is no longer the case. For the outdoors, there’s the Norfolk Broads where you can sail, canoe, walk and cycle. Bird-watching and fishing are popular past times as the Broads are home to some very rare wildlife. You can hire sailing boats, motor cruisers (by the hour or the day) or even charter one of the last few Norfolk Wherry yachts, complete with crew. It’s a nice area to spend the weekend and with the game on the Friday evening, it’s an ideal time to stay overnight and make the most of the long journey to East Anglia. The Holiday Inn Norwich City (NR1 1HU) is right outside the stadium, but there are plenty of other hotels to choose from in the city centre. To Kill A Mockingbird is at Theatre Royal (NR2 1RL) from March 4th – 9th, with tickets priced £10-£20. Barbara Dickson is at the same venue on the Sunday at 7.30, with tickets ranging from £10 to £33. Norwich Castle Museum & Art Gallery (NR1 3JU) hosts a long term exhibition Viking: Rediscover the Legend showing how the Vikings shaped life in Britain. The kingdom of East Anglia was conquered by the Vikings in 869 when King Edmund was martyred. Entry is £9.50, children £8.10. Family tickets are £25 (1 adult) or £33.40 (2 adults). The over 65s, students, people with disabilities and adults receiving benefits pay £9. Discounts are available if tickets are bought on-line and is worth a visit. 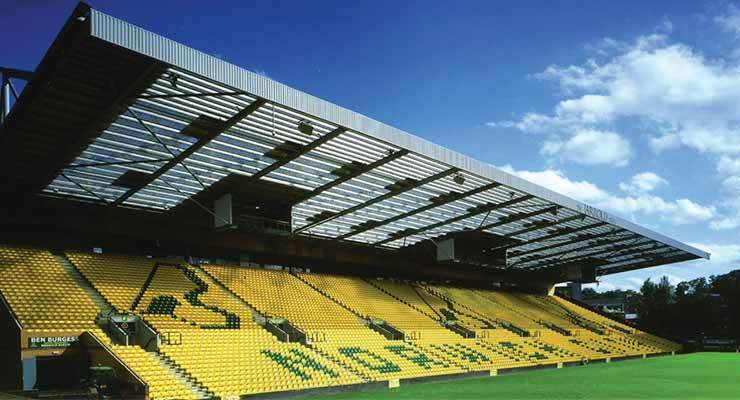 A five minute walk from Norwich train station and 0.7 miles from Carrow Road is the Stadia Bar (NR3 1RB), with Sky and BT Sports being shown on over 20 screens. It doesn’t serve food but you can bring your own in, including takeaways. Around the corner is the Prince of Wales (NR1 1LB), it’s a Greene King pub and has a large menu to choose from. The Coach and Horses (NR1 1BA) brews its own beer, with both pubs being 1.3 miles from the ground. Many away fans go to the Compleat Angler (NR1 1NS) by the river opposite the train station. It’s a 1 mile walk to the stadium and has an outside terrace, BT and Sky Sports. The Fat Cat and Canary (NR1 1TR) serves a number of real ales and has Sky TV and is 0.5 miles away. The Riverside (NR1 1WT) a leisure complex is 0.5 miles away and has many eating and drinking places, including a Lloyds Bar, Nandos, Pizza Hut, TGI Fridays and Chiquito. A good car park for away fans is Norwich County Hall (NR1 2DH), which costs £8 and holds about 2000 cars. It’s best to arrive early if you want a good spot, or you may be parked at the back, taking ages to exit! Alternatively if you want to avoid the crowds, you can also choose from a selection of private car parking spaces near Carrow Road – including around 31 parking spaces which you can reserve for your visit from just £4.00 for the day. The ground is a 0.7 mile walk from the station. Trains from Swansea leave at 09:55, 10:29, 11:29, 11:55 and 12:29 for the 6 hour journey. Unsurprisingly there are no trains back to Swansea after the game – so you’re going to need an overnight stay!